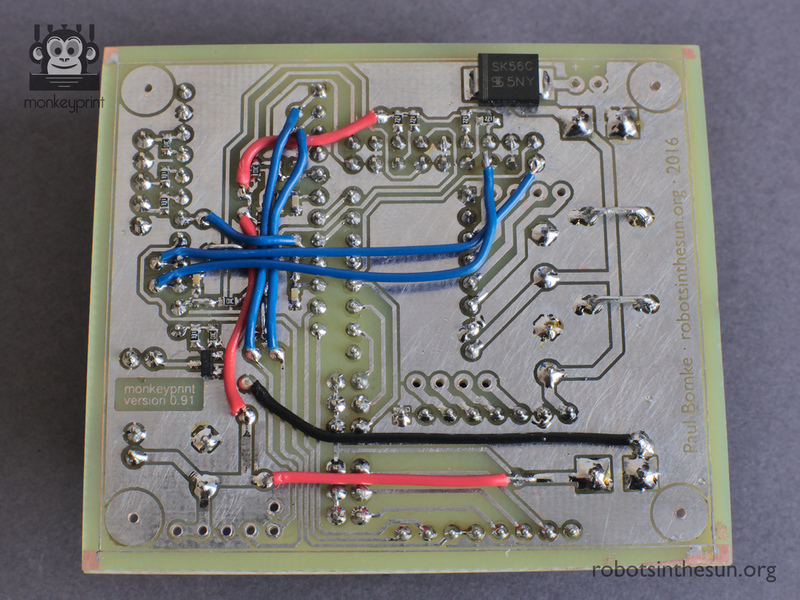 In the previous Monkeyprint board tutorial I showed you how to etch the PCB. 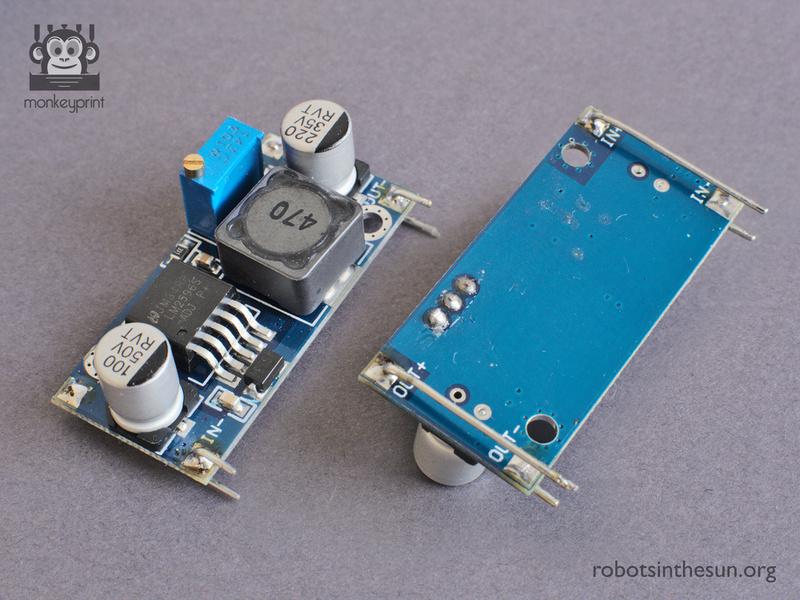 In this follow up, you will be soldering the components to get your board going. 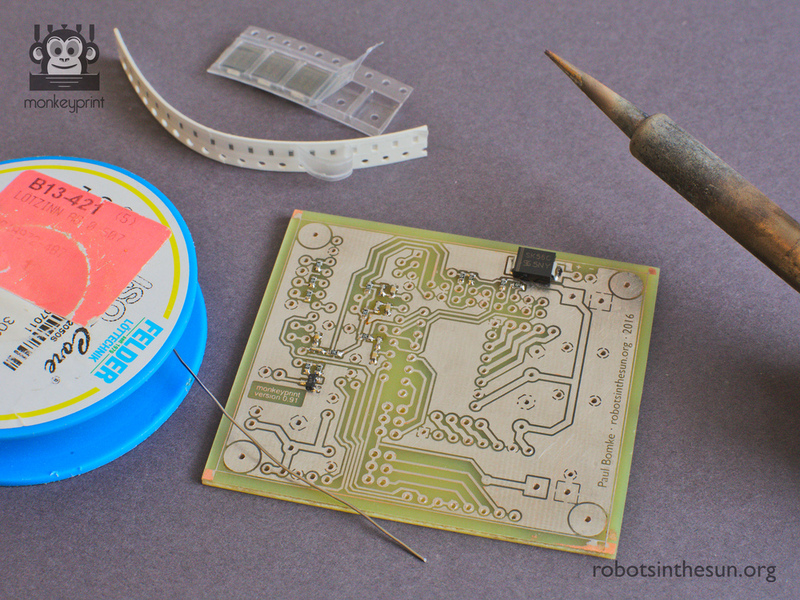 Warning: In this tutorial you will be soldering. Use a good and heavy stand to store the hot soldering iron while not in use. Also, the flux contained in the solder might pose a risk to your health. Do not inhale the fumes or better, use a small fan to blow them away from you. The procedure for soldering surface mount or through hole components is always the same. I will describe how I do it in the following paragraphs. 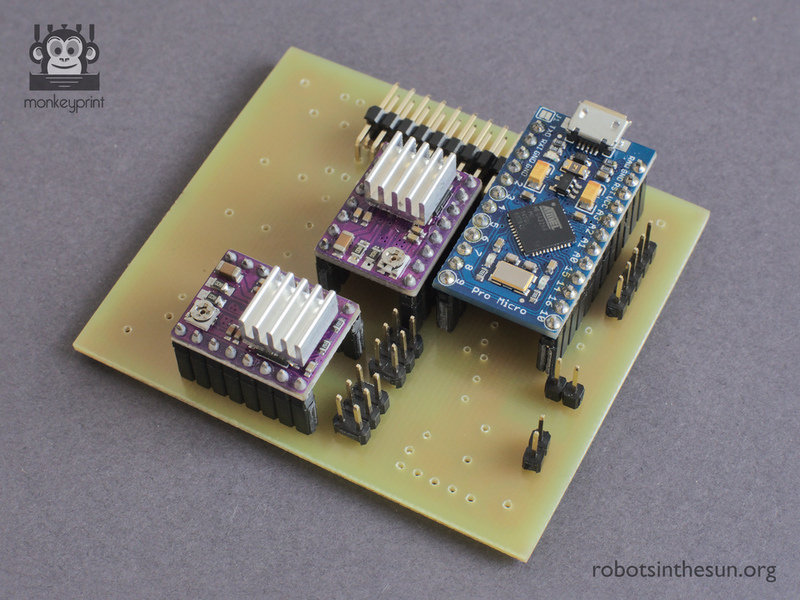 You will be soldering small surface mount components. It’s easier than you might think and you do not need anything special to do it. Do not be intimidated by the small size of the parts. I use a regular soldering iron and regular solder. Solder. I use 0.5 mm SN62Pb36Cu2 with internal flux. First, heat up the pad and/or the component. Then, and only then, apply the solder. 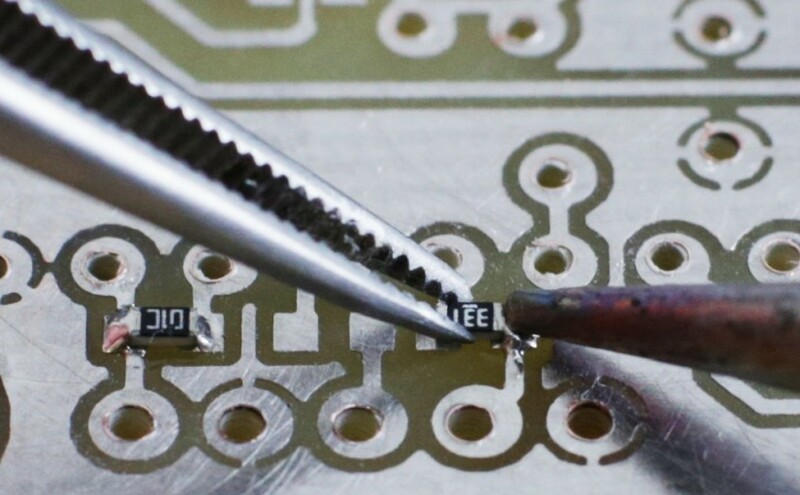 Do not put the solder on the iron tip as the internal flux will evaporate before you manage to apply the solder to the pad. All soldering actions should only take some seconds. 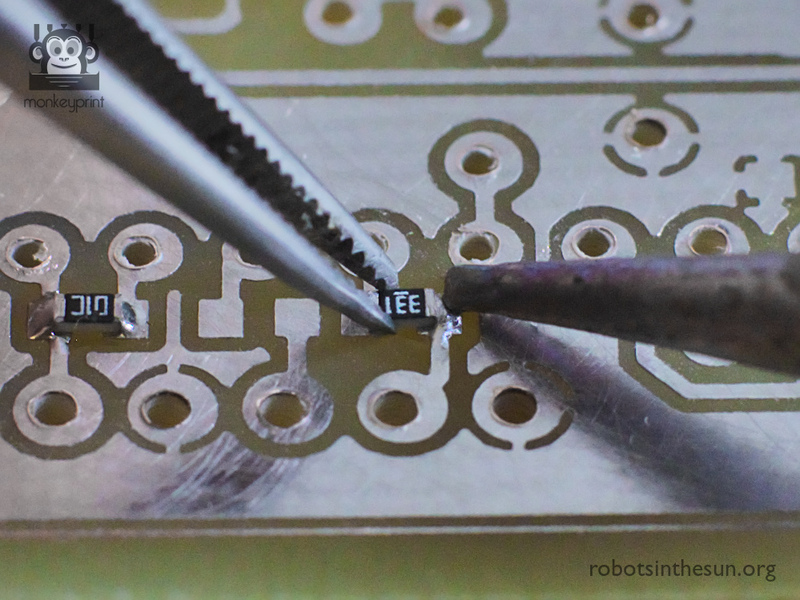 To solder a component follow these steps. 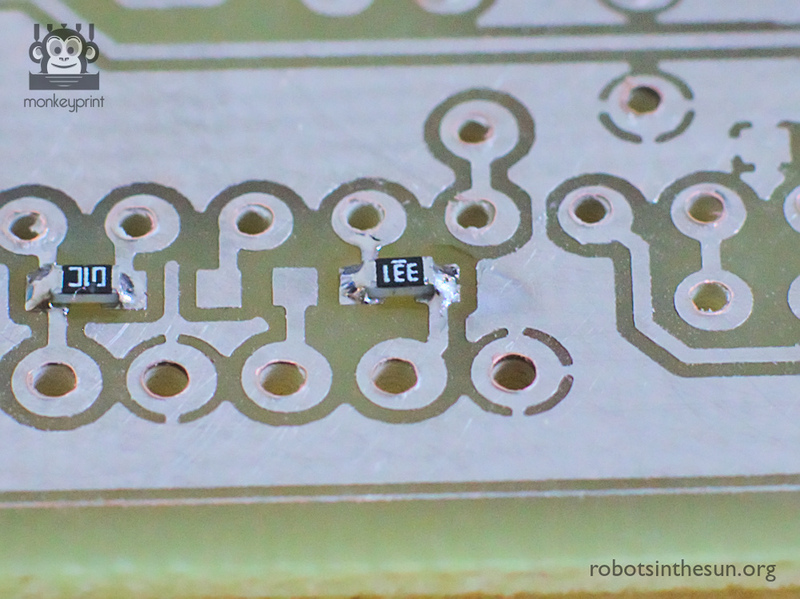 Step 1: Apply a small amount of solder to one of the pads. Again, heat the pad first, then apply the solder. Step 2: Place the component on the board using the tweezers and press it down firmly onto the solder blob you applied before. Make sure it is centered nicely on its footprint. 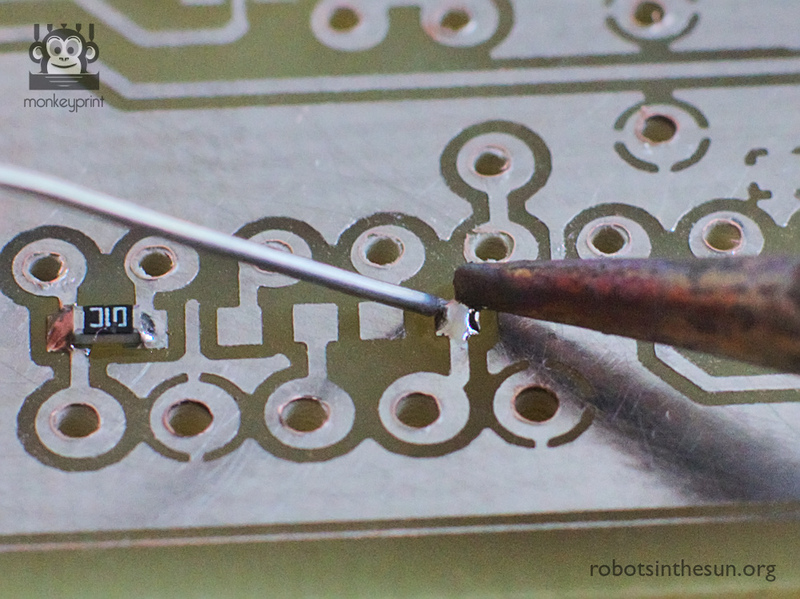 Then, heat the solder again until you notice the component sinking down onto the board. The component is now fixed to the board. Step 3: Heat the other pad and the part simultaneously. Then apply some solder to the other pad. 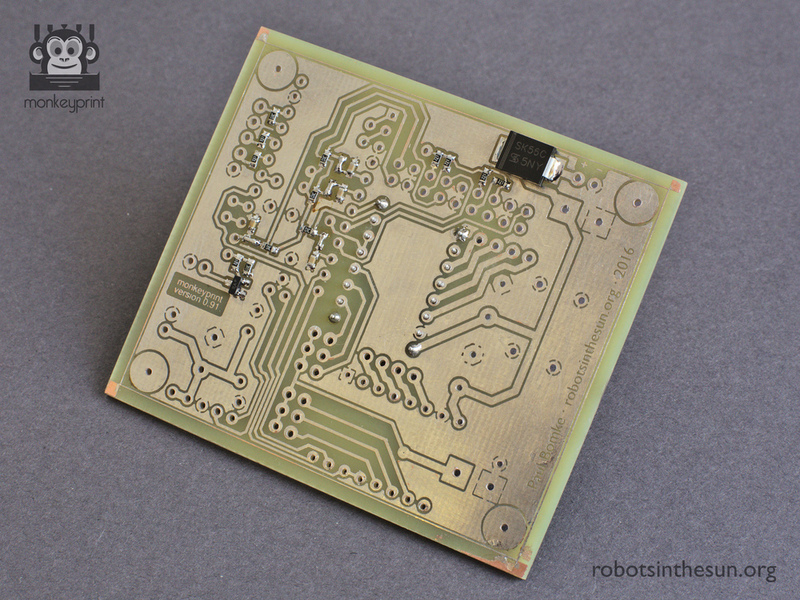 The result should look like this: a shiny, concave solder blob on each of the pads. The Monkeyprint component placement guide shows you where to solder the surface mount and through hole components as well as the wire bridges. Start by soldering the resistors and ceramic capacitors. They do not have a polarity, so as long as you follow the placement guide you will be fine. For the 0 Ω resistors I use a piece of wire. Simply cut it off from one of the large through hole capacitors’ legs. The small MosFET fits one way only. Make sure not to heat it up to long. As mentioned before, all soldering actions should only take some seconds. All the resistors/wire bridges and capacitors are soldered. 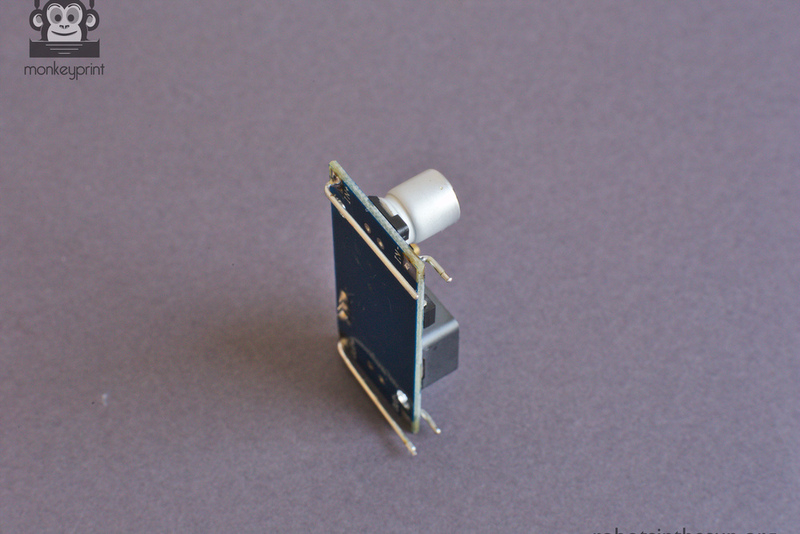 The tiny MosFET is attached as well. Make sure not so fry it by heating it more than a few seconds. Carry on with the large Schottky diode. This one — like all diodes — has a polarity, so make sure not to flip it. The white bar on the package is the negative side. Think of it as a big minus sign. 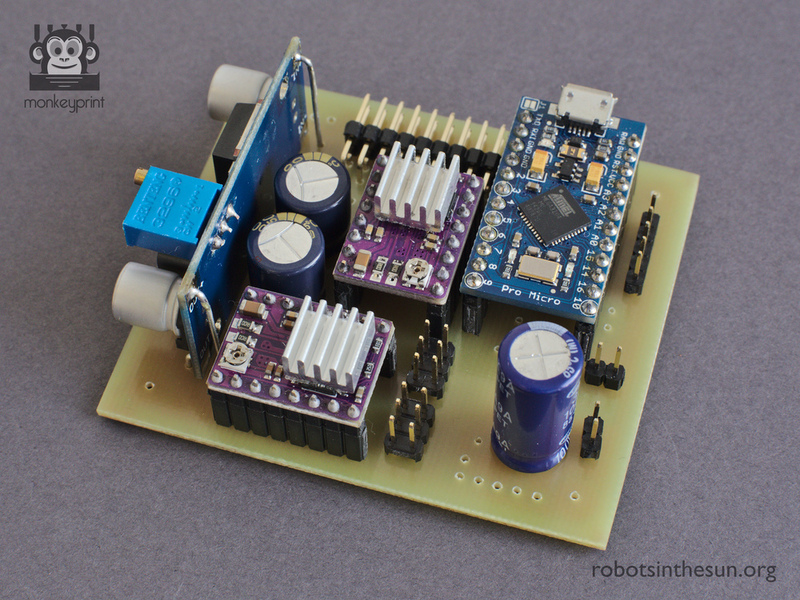 The large Schottky diode is the Monkeyprint boards’ reverse voltage protection. Pay attention to the polarity. The white bar is the (-) side. 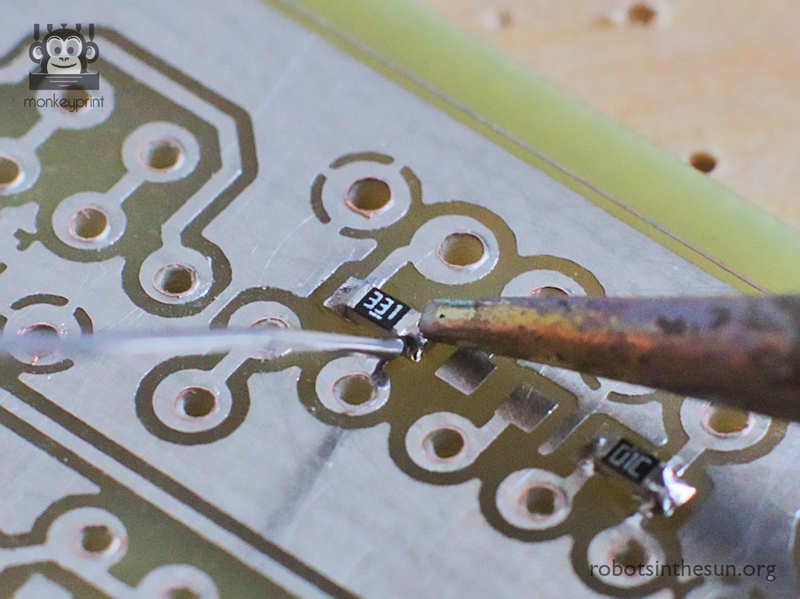 The Schottky diode is the last surface mount component to be soldered. Once you’re done with it, let’s carry on with the connectors. 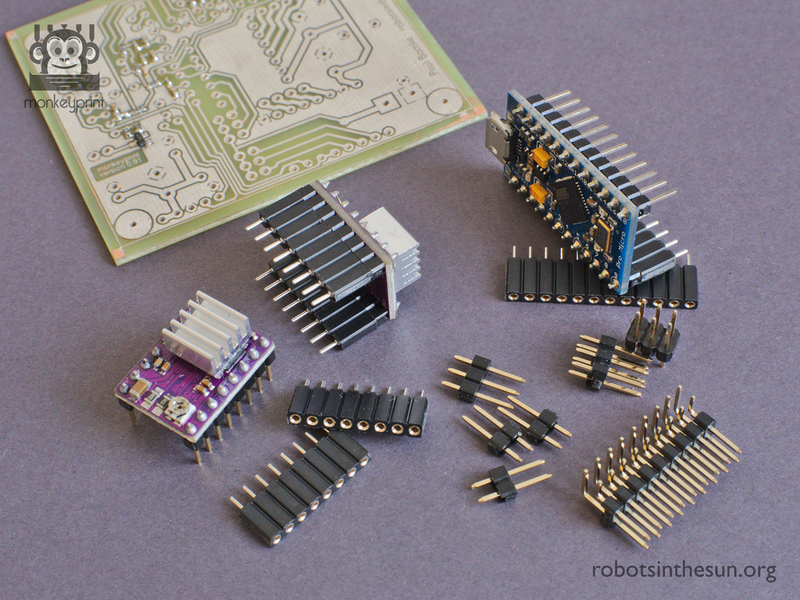 The through hole connectors for attaching the µC board, the stepper drivers and other peripherals ready to be soldered. 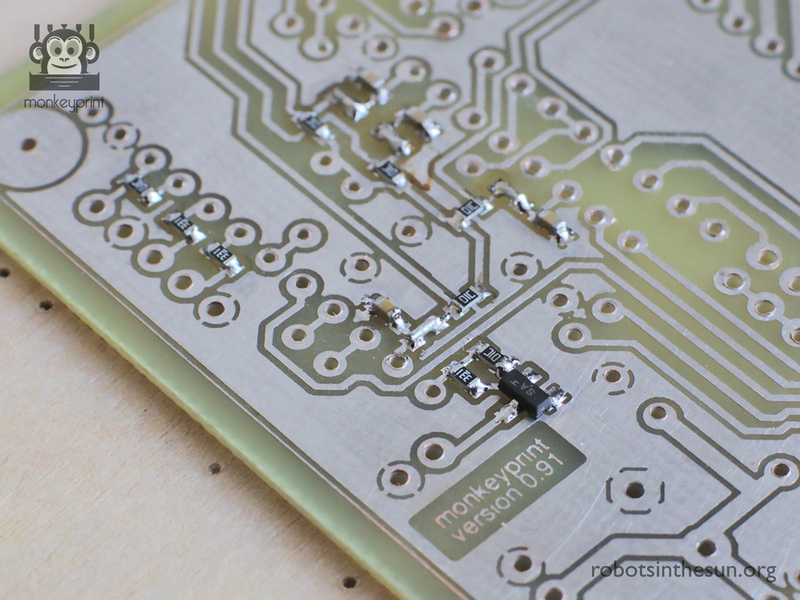 … and then solder the whole thing to the Monkeyprint board. This way the connectors will be fixed in a position that fits the component. This is the Monkeyprint board with the connectors soldered. The rest of the components like the electrolyte capacitors is easy to solder. 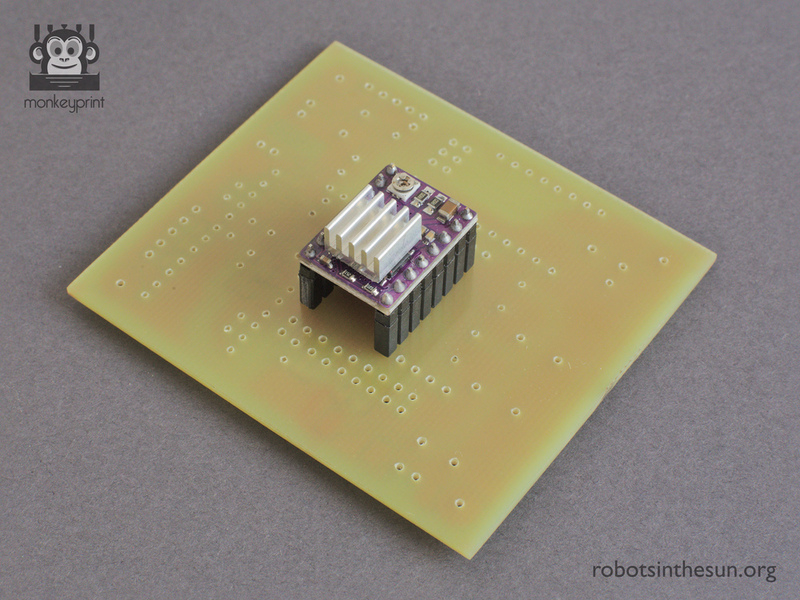 Simply stick the legs through the holes, hold the component firmly against the board and solder the pads. The tricky part is the step down converter. It has to go onto the board in an upright position in order the fit the Raspberry Pi A+ footprint. To mount the converter upright, cut two pairs of wire (diameter about 0.8 mm) to a length of 10 mm and 30 mm respectively. Solder the long ones to the (+) pads so that they are pointing into the non-populated side of the converter board. Then, solder the short wires the the (-) pads of the board so that they point to the populated side. Bend both pairs of wire down like shown in the pictures below. 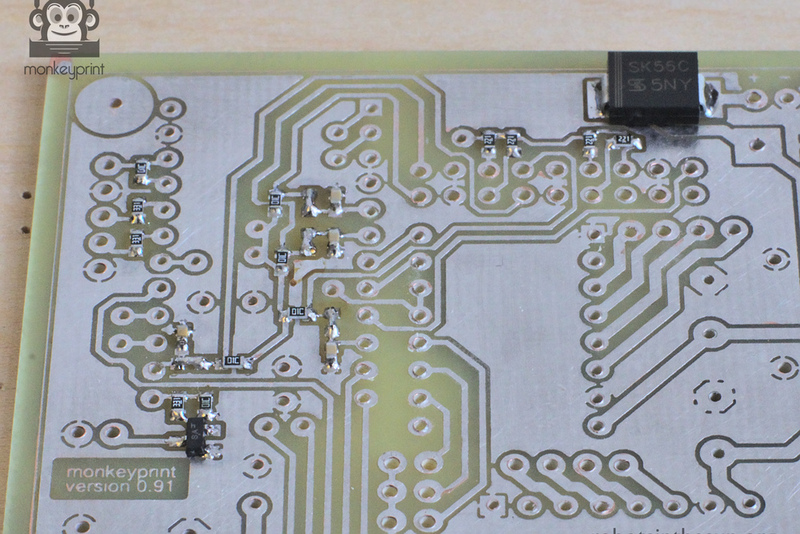 The converter board is now ready to be soldered onto the board. Top and bottom view of the step down converter board with the wires attached. The distance between the adjacent wire pairs should be about 5.1 mm. Make sure the (+) wires do not touch the respective (-) wires. 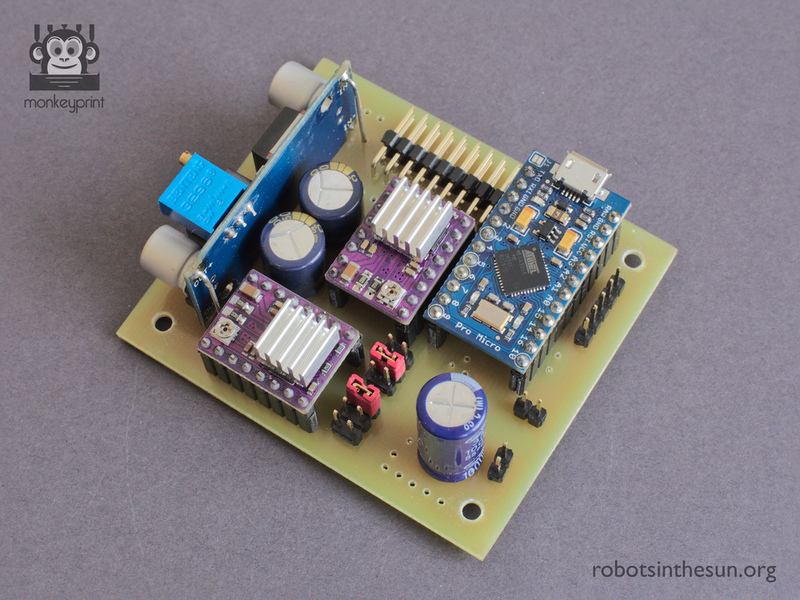 Side view of the step down converter board with wires attached. Again, the (+) wires must not touch the (-) pads. Then, simply solder the converter onto the board. The populated side should point outwards. This is the board with all the components soldered. Some insulated, flexible thin wire. I use 0.14 mm² wire. Black, red and another color would be nice but is not necessary. Some blank, stiff wire that I cut off from the larger through hole capacitors. Connect the remaining pads following the component placement guide in the hardware folder. Use red for 5 V, black for GND and another color for the other signals. For short bridges use the stiff wire and bend a U-shaped connection. There are holes in the wire bridge pads but I tend to solder them to the copper side just like surface mount components. This way you do not have to work your way around all the components on the top side. You have almost completed the Monkeyprint board! 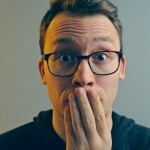 In a follow-up tutorial I will show you the steps to connect your Monkeyprint board to all the other components like stepper motors, end switches and the Raspberry Pi. The Monkeyprint board with all components and jumpers attached. I also drilled the mounting holes to 3.5 mm to allow for M3 screws to go through. If you like this or if you have questions or remarks, please comment below!